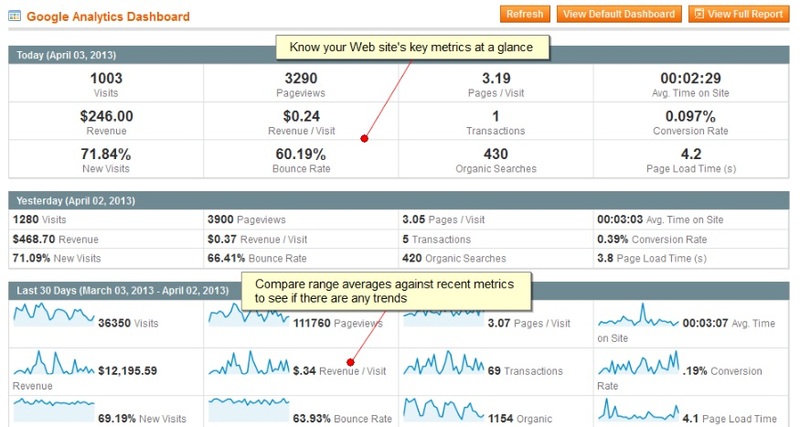 It is no longer necessary to leave your Magento admin to view Google Analytics stats. You only have to install Extendware Google Analytics Dashboard, and all the necessary information will appear in your backend. Thus, you will see whether your online business is staying on top of its analytics or not. The extension eliminates the need to switch between tabs and backends, because all vital data is gathered within a single interface. The Extendware Google Analytics Dashboard Magento module even provides the ability to replace the default Magento dashboard, but you can still use both solutions. Check the backend section of this post for further information. There, you will find a Magento extension tutorial that describes how to configure Extendware Google Analytics Dashboard. But why is the extension so important? 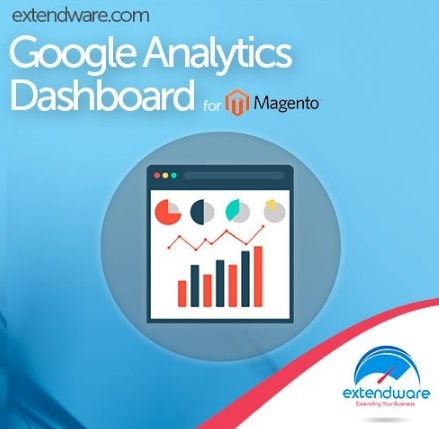 Google Analytics Dashboard by Extendware makes routine administrative tasks more user-friendly and less time-consuming, so they can be performed more often than in case of default Magento. Frequently viewing analytic data helps to leverage various trends that affect your business. At the same time, you can stop malicious tendencies at their early stages. With 12 key metrics, you will always know what happens within your online enterprise. Your Analytics in a Familiar Backend. Forget about the inconvenience of logging to a 3rd party provider while viewing key analytic metrics. All the necessary data is always available right within your Magento backend. Leverage Trends. To leverage (or stop) various trends, you can compare your current data with other time periods: vs yesterday, last 7 days, or last 30 days. Thus, you will easily identify growth or regression in your store’s performance enhancing the first tendency and preventing the development of the second. Response Time – page load time. Data Lists. Besides, the extension offers two important data lists: Top Referrers and Top Content. The first one illustrates top referrers to your website and shows how much revenue they generate. The second data list consists of top visited pages and shows their pageviews. Custom Time Intervals. Extendware Google Analytics Dashboard lets you create custom time intervals to compare various stats. Thus, you can view information for today, yesterday, last week, month, and year, or anything you want. Create any important time frame and use it according to your ecommerce needs. Various Display Types. There are two display types available in the dashboard: graph and text. You can easily select one that is more convenient. Custom Order. You can easily rearrange the existing order of metrics or even hide ones you do not use, making the dashboard fitting your needs as much as possible. 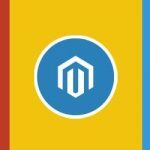 The following Magento Extension tutorial illustrates how to configure the module. First of all, go to the backend of your storefront and visit Extendware -> Manage Extensions -> Google Analytics Dash -> Configure. There are three tabs of settings there: General, Advance, and Developer. 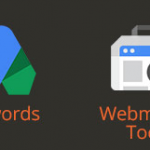 The General tab lets you choose the default dashboard – Google Analytics or Magento. Note that the chosen one will appear when logging in for the first time or clicking the “Dashboard” link on the admin menu. Next, you should specify your Profile ID and other credentials. As for the Profile ID, it is the numeric profile ID of your Magento website. Don’t confuse it with the public property ID. Now, you have to fill in the Google Analytics authentication configuration field. If you have no idea about what is it, check Extendware User Guides. 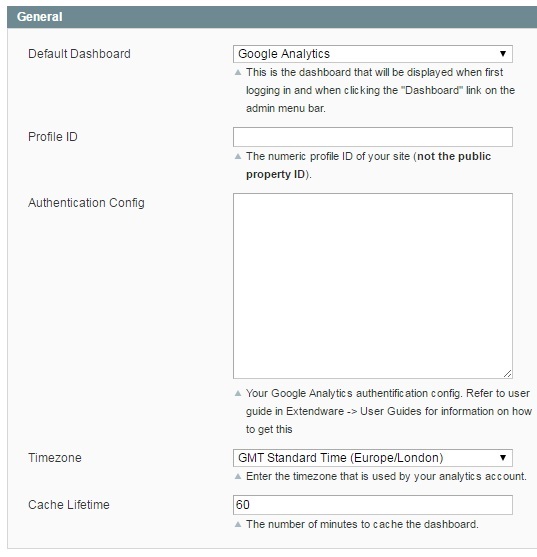 Next, you should choose the timezone of your analytics account as well as specify cache lifetime – the number of minutes the dashboard will be cached. As for the Advanced tab, it is divided between two sections: Top Content and Top Referrers. 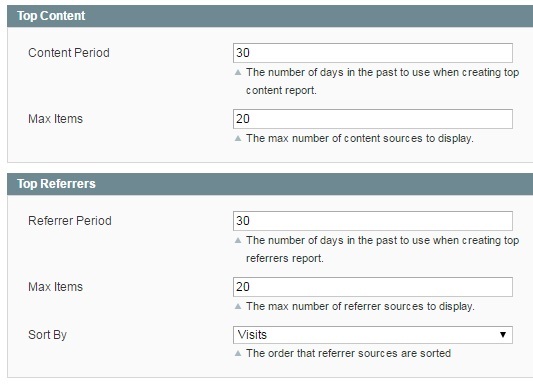 In Top Content, you specify a period in days that will be used for generating a top content report and choose a maximum number of content sources to be displayed. As for Top Referrers, you also specify a period and a maximum number of referrers to be used for creating the appropriate report. Besides, there is the Sort By option that lets you choose order that referrer sources are sorted (by visits or by revenue). Under the Developer tab, you can completely customize each report by setting date ranges, changing metrics order, and removing metrics. As you can see, the Extendware Google Analytics Dashboard Magento extension is extremely easy to configure. 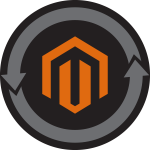 As a result, you get all the vital information in the familiar Magento backend. And there is no need to login to Google Analytics account every time you want to check your business stats. Our CloudFlare® Control is based on the same principle, so we understand the importance of having all ecommerce instruments in one place. You can take your interaction with Google Analytics to a completely new level for just $79, so don’t hesitate to enhance your store with useful data.